Applications are being accepted for field volunteers on the 2001 dig season at the site of Tell er-Rub'a (the ancient Mendes) in the eastern Nile delta. 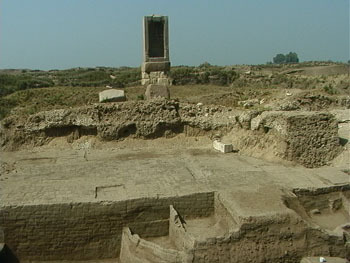 Over 3 square kilometers in extent, the ruins of Mendes constitute the largest surviving ancient city in the Egyptian Delta. First occupied in the predynastic period (mid-4th millennium B. C.), the site was continuously occupied into medieval times, and today survives in four small villages around the periphery of the ruins. The sometime capital of Egypt (4th century B. C. E.), Mendes was a trading center and entrepot, boasting a harbor, in contact with Greece, Cyprus, Israel and Phoenicia. *Cost includes room and board (3 meals a day + bottled water, 7 days per week), three field trips to antiquities sites, transportation to and from Cairo upon arrival and departure, and tuition (mandatory) for 6 university credits. Cost does not include international air-fare and expenses incurred off-site. Applicants must hold a passport valid through 2001 prior to application deadline. Return to the Akhenaten Temple Project Home Page. Visit Penn State on the web.